Blackbushe airport was first built in 1941. Originally called RAF Hartfordbridge, it was built on the area known as Hartfordbridge flats. Following a standard airforce design, it consisted of three all-weather runways, capable of taking the largest aircraft flying at the time. Unique was the proximity to the A30 which disected the southern perimiter of the field, and caused security challenges in the early years. On 11 August 1942, the first squadron took up residence, the Aero Airborne squadron from Farnborough. The airfield was still under construction at this time, however the runways were used for testing Horsa and Hotspur gliders. By the end of the year, construction was finished, with three runways, eleven hangars, and a large camp site. The A30 was closed to traffic, with cars routed through lanes via Minley. During 1943, several squadrons moved in with Tomahawk, Spitfires, Venturas, Mustangs all frequenting the airfield. In addition the airfield became a diversion for Bomber command, and so Halifax, Lancaster, Fortress, and Boston aircraft were all frequent sights. By 1944, over 3,000 airmen were based at the field. RAF Hartfordbridge was also the home of a new system known as "FIDO" (Fog Investigation and Dispersal Operation) built by the Airforce Construction Unit. Pipes were laid down both sides on Runway 26, and fed with fuel. The pipes had small holes, and if the airfield was shrouded in fog, the fuel was ignited. The heat created would cause the fog to rise and disperse. 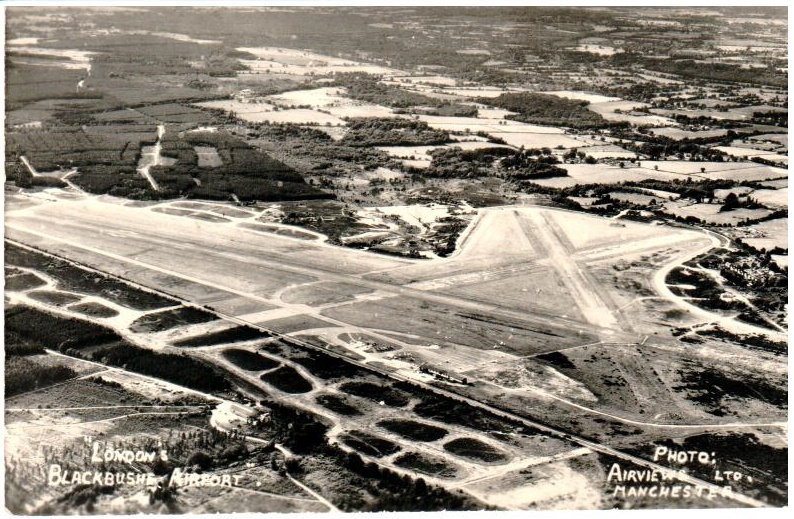 On 18th November 1944, the airfield was renamed to RAF Blackbushe, due to confusion over a similar area in Norfolk. On 15th November 1946, the RAF had moved out, and the airport was handed over to the Ministry of Civil Aviation, becoming Blackbushe Airport. The A30 was reopened to traffic. The first civilian flight was actually in September 1945, a Danish Airlines regular service to Copenhagen and Stockholm, using Fortress and Focke-Wulf Condors. The first major Air disaster to hit Blackbushe on October 5, 1945. A Czechoslovakian Air Force Liberator took off with repatriated Czech civilians, on its way to Prague. Seconds after take off, the aircraft crashed, killing 23 on board. Over the next few years, airlines such as Britacia, Westminster Airways, Airwork, and Silver City all moved in operating Lancastrians (passenger carrying Lancaster Bombers), DC-3s, and Bristol Freighters. Movements by 1950 had risen to 11,000 per year, with 16,000 passengers. The 1950s saw further expansion, Air Contractors started a scheduled service to the Channel Islands, and Eagle Airways launched several routes to Europe on DC-3s and Viking airliners. Britavia and Airwork also brought in the Hermes airliner, flying charters to Africa and Australia. Blackbushe became a robust diversion airport for London Heathrow, and as a home for aircraft visiting the Farnborough Airshow. The facilities were constantly being upgraded with new buildings, runway extensions, and new navigational aids and lighting. By 1955 the airport was handling 36,000 movements per year. The US NAvy also set up a base as a communications headquarter. This brought new aircraft such as Beech Expediters, Dakotas, DC-7s and Super Constellations. In the late 1950s, B.O.A.C. launched operations of the Comet airliners. Other operators such as Pan-Am, S.A.S. B.E.A and others were using Blackbushe regularly as a diversion from Heathrow. Sadly, with the newly built Gatwick airport, the lease on Blackbushe was not granted, and these operators were forced to start using Gatwick. In 1960 Blackbushe Airport was closed, and all of the infrastructure, fixtures, and fittings were auctioned off. Parts of the runways were dug up. The airport remained closed until 6 October 1962 when it was formally reopened as a general aviation field. Blackbushe has an important historical place in British Drag Racing history. It was the scene of the legendary Dragfests, which brought many famous American names like Garlits, Ivo and Nancy, and inspired so many Brits to go away and build their own machines. It was adopted as a regular venue for the fledgling NDRC in 1970 and they continued to use it regularly until 1984 when the site was sold for development. There is a fantastic film of the British Drag Racing Festival at Blackbushe from British Pathé online here. Harvey Goldsmith put together one of his biggest ever events, with over 200,000 people attending the concert with Bob Dylan, Eric Clapton and Band, Joan Armatrading, Graham Parker and The Rumour, Lake, and Merger all performing. A full account of the day is available here. From 1985 to 2015, the airport was owned by British Car Auctions, who refurbished the terminal building, and replaced the tower in 1992. In 2008, the newly formed Blink launched their European air-taxi service from Blackbushe to over 600 destinations using a fleet of Cessna Citation Mustang aircraft. These are now a regular sight at Blackbushe. In 2014, PremiAir, who had been based at Blackbushe since the mid-1990s, and who operated light jets and executive helicopters from Blackbushe, went into administration. They vacated the 40,000 sq ft of hangars on the north side, and BCA re-purposed them as part of their auction facilities. In 2015, the airport was sold to a group of investors led by Sir Peter Ogden. These investors have a passion for aviation, having founded Blink in 2008. The north side hangars were not included in the sale, and so Blackbushe currently has no hangar facilities available to the aviation community. The new owners plan to invest in the refurbishments of the airport and bring the facilities into the 21st century, including building new hangars to replace the space lost on the north side. Read more about their plans here. We are very thankful to have Peter Brown as a great supporter of the airport. Peter has a wealth of knowledge on all things Blackbushe and he gladly shares this on his incredibly informative, Blackbushe One Stop Forum! Learn more about the history of Blackbushe, join a discussion or simply enjoy the photos. There is a photo library that will keep you enthralled for hours - well worth a visit!